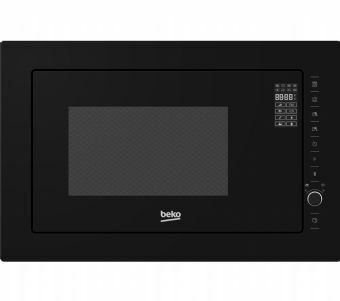 Benefit from clear countertops with the stylish Beko Select MGB25333BG Built-in Microwave with Grill in black. This 900 W microwave features five power levels and eight auto-cook programmes including pizza, meat, vegetable, fish - even popcorn. The MGB25333BG also boasts a spacious 25 litre cooking capacity and a 1000 W single grill, which is great for toasting or browning your food quickly without the hassle of a traditional oven. For a unified, clutter free look in your kitchen, you could choose an integrated microwave like the Beko MGB25333BG. Aided by the sleek black glass front and aluminium interior, this oven will blend in neatly with any kitchen style. With a sleek, mark resistant coating, the MGB25333BG is very easy to keep clean. Simply use a damp cloth to wipe away dirt and grease, and keep it looking its best. What's more, this microwave has digital LED display with easy to use touch controls. Fully programmable, the menu functions are simple to navigate. For all of your grilling and microwaving needs, the Beko Select MGB25333BG Built-in Microwave with Grill has you covered.